Third Place:Summertimeby William Phillips, Jr., Augusta, Georgia. Judge: Matthew Neil Null is a novelist (Honey from the Lion) and short story writer. A graduate of the Iowa Writers’ Workshop, he is a winner of the O. Henry Award, the Mary McCarthy Prize, and the Joseph Brodksy Rome Prize from the American Academy of Arts and Letters. After a two-year residency at the American Academy in Rome, he is on the English Department faculty at Bryant University in Smithfield, Rhode Island. Judge:Ellen Hemphill, an award-winning poet and playwright, is an Associate Professor in the Theater Studies Department at Duke University. She is also the Artistic Director of Archipelago, a professional theater company in Chapel Hill, North Carolina. Judge Alan Shapiro, the William R. Kenan, Jr. Distinguished Professor of English and Creative Writing at the University of North Carolina at Chapel Hill, is a distinguished American poet. He is the author of thirteen collections of poetry, including Tantalus in Love, Song and Dance, and Dead Alive and Busy, as well as two memoirs,Vigil and The Last Happy Occasion. 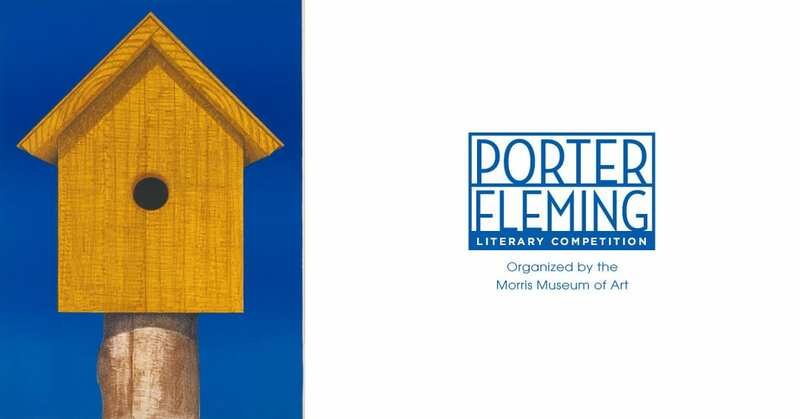 Awards Ceremony—Sunday, April 7, 2:00 p.m.
An awards ceremony and reception honoring the 2019 Porter Fleming Literary Competition award winners at the Morris Museum of Art. First-place winners will read from their entries. Seating is limited: RSVP to 706-828-3800. This event is free and open to the public. The Porter Fleming Literary Competition, recognizing talented writers who reside in Alabama, Florida, Georgia, Mississippi, North Carolina, South Carolina, and Tennessee, was established in 1993 by Shirley Fleming to honor her late father, noted author and artist Berry Fleming. Funded by the Porter Fleming Foundation, which is administered by the Trustees of the Academy of Richmond County, the competition is organized and directed by the Morris Museum of Art. The Porter Fleming Foundation was established by Berry Fleming in 1963 as a memorial to his father, Porter Fleming, a prominent Augustan and one of the city’s leading philanthropists.